Though life is full of strange surprises and the ways of the world are hard to fathom, some things can be relied upon: the world turns as it has, summer is past and gone and the dark of the year is here. Of course, it is that same reliable and inexorable turning that brings around the changes of life, and there you have it. I was at an old friend’s wedding a few months ago, having thoughts along these lines as I attempted to give a toast, and ended up turning into that guy at the wedding who cries a lot while holding up a glass of champagne and saying something almost entirely incoherent. It just seemed so poignant and beautiful to me that love and friendship that sticks around, that we keep coming back to through the changes of life, is what makes it all worthwhile… though it can be so easy to get carried away with the details of our lives, fall out of touch, lose track of love. So it seemed to me, as I was standing there at the wedding, looking out at loved ones and feeling the strength of the continuity that brought us all to that place after so many years. Anyhow, that was a long winded way to come to the point, which is that we are excited for our first trip back to Arcata in nearly 2 years, excited to make music in a place we love full of people we love… and just plain grateful for the opportunity to do so. It’s a small piece of continuity, perhaps, in the grand scheme of things, but it’s one we are attached to. We hope to see you there! West Coast tour with Jesse Harper, this February! Hello and happy solstice! In a shocking piece of news, we have news. Yes, after a brief hiatus to collectively collect ourselves, we Bee Eaters are back at it with a new collaboration to share, and much more, in the coming year. The inimitable Jesse Harper will be joining us for a swing through California and Oregon this February, from San Diego to Summit, lending his soulful vocals, guitar and original songs to the mix. Stay tuned for more news as many plans for the year take shape! Here’s more on the collaboration with Jesse, and a link to a video so you can get a glimpse of what he’s about (below). Singer, song writer, and guitarist Jesse Harper joins The Bee Eaters for three weeks in California and Oregon; a union of soulful songs and rich ensemble playing, traditional rhythms and pop energy. Though they live on opposite coasts, Jesse and the Bee Eaters are long time collaborators, playing whenever they cross paths at a festival or on the road; but most of all at the yearly String Summit in Mt Shasta, CA, where musicians from around the world come to share ideas and inspiration. These four have woven together the common threads of their different styles – a grounding in Appalachian, Irish, and bluegrass, a love of jazz and chamber music, and a passion for innovation – into a musical vocabulary that feels like walking through a familiar door and finding yourself in a new place. It’s summer again, and that means that the annual Summer String Summit in Weed and the Shasta String Celebration in Berkeley are right around the corner… which also means that Tristan and Tashina have been burning the midnight oil, sending emails and logisticating madly. In spite of that, the three of us just spent an equally frenzied but logistication free week in Weiser, ID, at the National Oldtime Fiddlers Contest, playing and listening to texas style tunes till the tips of our fingers were black and rags, hornpipes, breakdowns were haunting our dreams. Tristan came away with third place and Tashina with fourth, but the most novel news of the week was the homemade blackberry pie that Tashina won for second place in the “other” category of the banjo contest… I’ll leave the details of that to your imagination. Now, from the chaos of the warm up room in Weiser, we’re heading east to teach at Megan Lynch’s Fiddlestar youth camp in Nashville, TN, for a few days. We’re really looking forward to that, to playing music with the kids and seeing Megan and Adam. 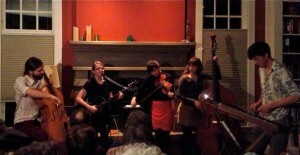 And all the while, the wheels of the String Summit concerts will be spinning. 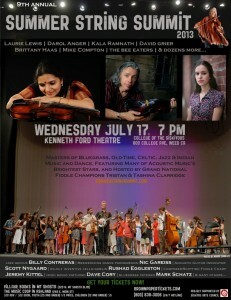 Here’s the line up for the String Summit, which takes place on July 17th at College of the Siskiyous. Grammy-Winning Songwriter/Singer/Fiddler Laurie Lewis, Legendary Chambergrass Iconoclast Darol Anger (Co-founder Of The David Grisman Quintet & Psychograss), North Indian violin maestro and International Treasure Kala Ramnath, Mesmerizing Dance Phenomenon Nic Gareiss, Footworks Percussive Dance Ensemble Founder Eileen Carson, Jazz Violin Genius Billy Contreras, Folk-Pop Singer Jesse Harper, Legendary Appalachian Music Master John Herrmann, Composer/Scottish Fiddle Champion Jeremy Kittel, Irish Tenor Banjo Virtuoso Dave Cory, Old-Time Fiddle Powerhouse Brittany Haas, Bluegrass Veteran Mark Schatz (Bassist For Platinum-Selling Band Nickel Creek), Bluegrass Guitar Master David Grier, Acoustic Guitar Innovator Scott Nygaard, Bluegrass Mandolin Icon Mike Compton (Featured on “Oh Brother Where Art Thou?”), Chambergrass Innovators The Bee Eaters, And Many Surprise Guests.